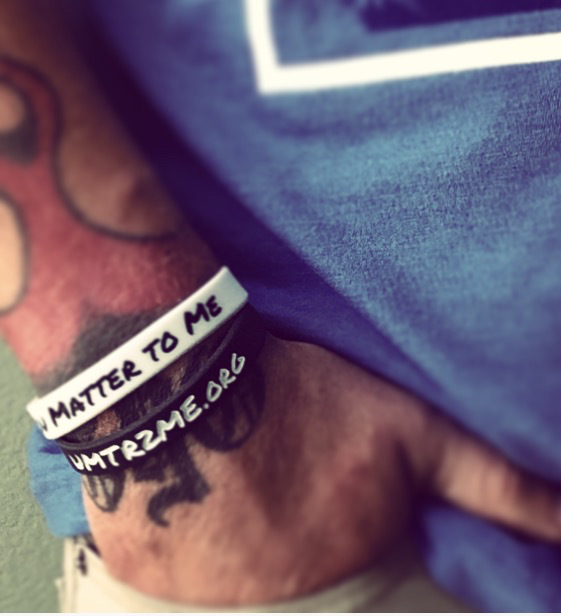 UMTR2ME, which simply stands for the phrase, “You Matter To Me,” is a nonprofit organization that offers hope, support, and encouragement to individuals who struggle with depression, mental health challenges, thoughts of suicide, and those who have attempted suicide, in addition to supporting family and friends. One of the most impactful ways we achieve our mission is through our core UMTR2ME silicone bracelet campaign. Although the bracelets have gone through some minor design changes since we first launched them in August of 2012, the core message has never changed. In his own words below, Jimm shares his visor for that message. “I had a vision these bracelets would serve two purposes while creating a unique and personal experience to everyone who wears one. On one side of the bracelet I wanted to have what I thought was the simpliest yet single most powerful message a person could ever hope to hear from another person, “You Matter To Me.” I envisioned that whenever a person would find themselves in a dark or hopeless place they would look down at the bracelet on their wrist and be reminded that they mattered. I wanted the other side of the bracelet to have the UMTR2ME website listed so a person had a place they could go to find resources. Resources that would be available to assist with whatever struggles a person might be going through. Struggles like addiction, depression, self-harm, mental illness, or any other struggle that might leave a person with the disillusioned idea that suicide is the only solution to their present pain. I want anyone who wears a UMTR2ME bracelet to feel empowered to share their story when asked about the bracelet on their wrist. When I come across someone who takes the time to share their own story with me, I offer to give them my own personal bracelet, but I don’t just hand it to them. Instead, I ask if I can put your bracelet on their wrist and when I do I make sure the words “You Matter To Me” are facing towards them. I thank them for sharing their story and tell them “You Matter To Me.” This creates a personal connection. When that person finds themselves in a difficult place they can look down at the bracelet on their wrist and be reminded they matter specifically to me. I want anyone wears a UMT2ME bracelet to create that same personal connection. If you share your personal UMTR2ME bracelet with another person we want to hear about your story. In return we will replace your bracelet at no cost to you. 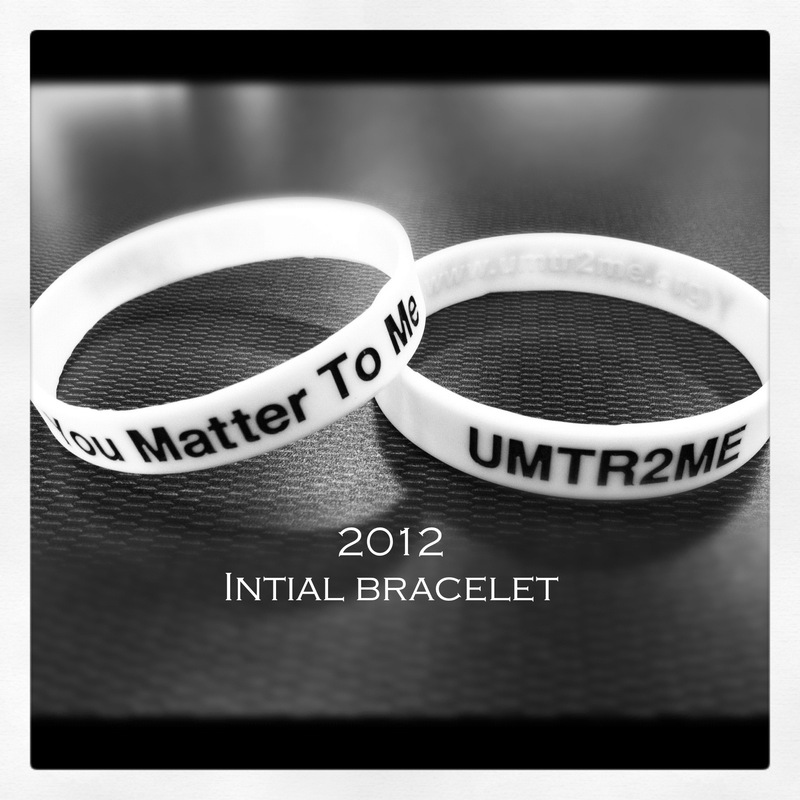 We believe it’s important for you to know that UMTR2ME does not sell these bracelets for a profit. All proceeds are put into the cost of purchasing, packaging, and shipping.